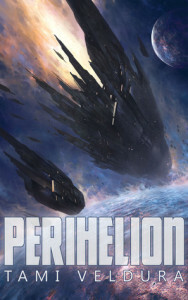 Perihelion was written for the Love Is An Open Road event for the M/M Romance group. It will be available for free, there. This story was written as a part of the M/M Romance Group’s“Love is an Open Road” event. Group members were asked to write a story prompt inspired by a photo of their choice. Authors of the group selected a photo and prompt that spoke to them and wrote a short story. I woke up to the sight of him coming out of a healing tank. I realized that I knew nothing but that this man was important to me. Please have this be in the middle of the story. I want to know what caused my amnesia, what we were before the amnesia, and what happened after this. A naked man rises from a tank of glowing blue liquid. Ports line his neck and ribs with cords extending from them, plugged into something unseen (and out of the picture). His skin is embedded with glowing circuits, and his shaved head bows forward. Mist floats around him as electric currents or lightning strikes illuminate the background. This was an interesting read for me. I have to say I liked the plot and getting to know the relationship between ship and pilot. The story itself is well written and very enjoyable, but I did have a few issues with it that made it hard to get into and stay into it. There are soooo many characters and things going on that I found myself skimming the parts that weren’t about our main two characters or Kato’s family because it felt like unneeded information.. oh and the AI ship, I did read those because it was important the the story as a whole. And maybe the other parts are important for a second book, but for this one they felt like they detracted from the story. I loved the way the two men piloted together as they both had their strong suits that complimented each other. However, the romantic relationship, I didn’t feel at all. I didn’t understand the whole situation with Mas’ud having ovaries, but being a man and it not getting any sort of explanation to go with it. Or how the two even connected except through their ties to the ship. Sadly, as much as I love a good romance, this felt unnecessary to the story as well since it wasn’t well explained to me. I have to say I liked all the drama with the family and trying to figure out why they were doing what they were doing in terms of political reasons. However, I felt like we didn’t get a whole lot of answers here either. Yet something else that might be answered with a sequel, but it didn’t give me enough to really want to keep going with the series sadly. All in all, it was a well written book that I enjoyed, but at the end of it I was almost glad it was over because I couldn’t keep up with the intense amount of politics and so many characters that didn’t seem to have a huge amount of importance to this particular story. Like I said, they may in the future, but it would’ve been nicer to have that not so heavy in the first book as we still didn’t even know our main characters and how all the queenship/kingship/families and all that even related/worked. Freelance editor: available for indie and self-pub authors. Email me!